Vile Creature are a formidable duo who have made their mark on 2018 with their latest opus, Cast of Static and Smoke. Hailing from Canada, we are thrilled to announce that this pair will be making the trek over to Roadburn next April. Once the excitement settles down to a low roar, you can expect something of a pummelling when they take to the stage in Tilburg. A heady mix of droning doom and sludgy bang-your-head-slowly moments, Vile Creature wear their collective hearts on their sleeve and don’t hold back. Whilst Cast of Static and Smoke may have its roots in a sci-fi-influenced short story that the duo concocted together, a immovable streak of socio-political commentary and compassion run through the very core of the band. Self-described “weird queer kids with lofty ambitions”, we’re hopeful that at least one of their ambitions will be fulfilled come April. 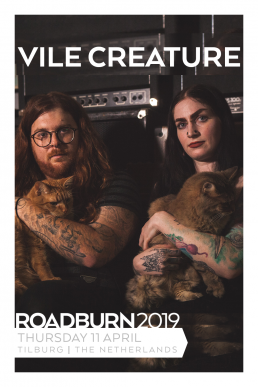 Vile Creature will play on Roadburn Festival 2019. Cast of Static and Smoke is out now.